Mrs. Dijana Spalatin is the Financial Director and Procurator for Cargotec Croatia and Financial/Business Controller of Cargotec for the region of Middle East. Ms. Spalatin has been with Cargotc (previosly MacGregor) since 1990. During her career in the company, Ms. Spalatin was appointed South Europe Area Business Controller (1995-1996) and South East Europe Business Controller (1996-2000). Before joining Cargotec, Ms. Spalatin held a position of Chief Accountant at the Croatian Automobile Club. She holds a degree in Economics from the University in Zagreb, specialized in Foreign Trade. She is married and has two children. Ms Gordana Fuštar has been Executive Director at the Nordic Chamber of Commerce in Croatia since 2009. Prior to joining the Nordic Chamber of Commerce, Ms. Fuštar held a position of a Management Consultant in Sweden, working with Swedish and Nordic companies with interest to entering Southeast Europe market. She started her professional career as Commercial Officer at the Embassy of Sweden. Ms. Fuštar holds a Master of Science degree in Business and Economics from Linköping University in Sweden with emphasis in Strategy, International business and marketing. She speaks Swedish, Croatian, English and Spanish. Mrs. Vesna Štefić is Division Controller in Process Automation Division at ABB Croatia. Prior to starting to work at ABB since February 2012, Mrs. Štefić worked at Siemens Croatia as Commercial Manager in Information and Communication Networks and Siemens Business Solutions (2000-2009) and as Project and Business Controller at Siemens Information Technologies (2010-2011). She holds a degree in Economics from the University in Zagreb specialized in Organisation and Management and Master of Science at Foreign Trade. Mr. Igor Žonja was born in Zagreb on 5 June 1967. He began his professional career as a programmer (IT) after graduating Maths from the Faculty of Science in Zagreb. In 1997, together with a partner, he established the company VIVA info Ltd, where he remains its director until today. 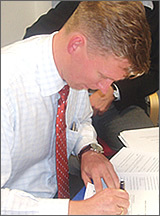 He decided to join Selectio Group in 2005 and became a procurator in Electus DGS Ltd in 2007. In 2008 he took the role as Chairman of the Board of Tau on-line Ltd (MojPosao). In addition, he is also a member of the Supervisory Board of Đuro Đaković Holding d.d., the Supervisory Board of Varteks d.d. and Supervisory Board of CV Online (Estonia, Lithuania and Latvia). Mr. Mario Krička is a Country Manager (Croatia and Serbia) for Brunata. He has an extensive international work experience in various industries – automotive, telecommunications, insurance and engineering. His career has started in IT, but Mr. Krička has subsequently performed several managerial positions in executive management, commercial and SCM/logistics. His work has taken Mr. Krička from Croatia to Bermuda, Albania and recently back to Croatia Mr. Krička holds a degree from the Faculty of Electrical Engineering in Zagreb and an MBA from the globally renowned INSEAD Business School with campuses in France, Singapore and Abu Dhabi. He is married and has two children. Mr. Ranko Režek is a Market Manager of DNV GL Business Assurance Adriatica region since February 2012. Previously he managed several sales positions for 12 years in Vipnet, part of Mobilkom Austria group. During this period as a member of greenfield top management team in VIP Mobile he successfully established sales network on new market. Since 2013 he is member of Governing Council in Croatian Business Council for Sustainable Development. Mr. Režek holds a degree from the Faculty of Electrical Engineering and postgraduate degree from the Faculty of Economic and Business specialized in Management and Organization. Mr. Režek is married and has two children. Mr. Željko Štruglin is a Managing Director for ABB Croatia as well as regional ABB Director responsible for Albania, Croatia, Bosina and Herzegovina, Kosovo, Macedonia, Montenegro and Serbia. Prior to assuming this position, Mr. Štruglin was Local Divison Manager for Process Automation in Croatia. He started his career in KONČAR Group, where he worked from 1984-1994. Mr. Štruglin holds a degree from the Faculty of Electronical Engineering, specialised in Radio Communications and Professional Electronics.